Some of the projects aimed at finding new scientific solutions to cardiovascular issues include: A study of how the parathyroid affects aortic disease. 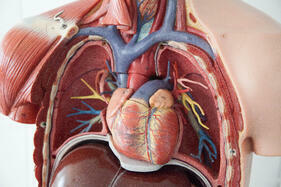 The Vice Chair of Cardiovascular and Vascular Medicine Director, Linda Demer, M.D. PhD. is the principal investigator for this. Research into new molecules found in triglyceride metabolism and adipogenesis (the process of cell differentiating into fat cells) is being led by Luisa Iruela-Arispe, Ph.D. Dr. Iruela-Arispe currently serves as Professor and Vice-Chair of Molecular Cell and Developmental Biology at UCLA. One of the largest NIH’s (National Health Institute) NHLBI grants, went to Dr. Peipei Ping, Professor of Physiology, Medicine/Cardiology, and Bioinformatics. This award of over $900k will fund the project titled “Omics Phenotyping for Identifying Molecular Signatures of The Healthy and Failing Heart: An Integrated Data Science Platform.” This research will employ a multi-pronged strategy for identifying molecular signatures that drive cardiac phenotypes, or traits such as morphology, development and physiological properties. In addition to being a professor and principal investigator, Dr. Ping has served as the director of the NIH Big Data to Knowledge (BD2K) Center of Excellence for Big Data Computing at UCLA since it was founded in 2014. She is also the director of NIH BD2K Centers-Coordination Center UCLA, founded in 2015. Signaling, regulation, and functional dynamics of protein degradation networks. Ten of the twelve grants went to were awarded UCLA’s David Geffen School of Medicine. The remaining two went to UCLA’s Schools of Arts and Sciences. 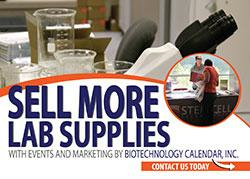 UCLA Researchers find science solutions as they meet with Laboratory Equipment Suppliers Meet at scientific event. 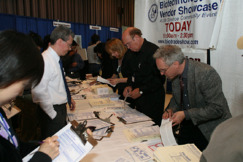 Science product vendors interested in increasing their laboratory product sales are invited to display relevant products at the the 39th Semiannual Biotechnology Vendor Showcase™ Event at UCLA. This on campus event will be held on Thursday, April 20, 2017, and will be hosted by Biotechnology Calendar, Inc. More than 400 life scientists are expected to attend. Last year, researchers came from 46 different research buildings and 80 on-campus departments. Science professionals, including researchers, PI's, technicians and post doctoral researchers are invited to come for free. Click the link below to for more information and find out how to preregister.